Your research, personality and body are central within your work. While some of your more recent projects like Public Sculpture (2009) or Your Ad Here (2008) deliver commentary on public art, your earliest videos comes across as earnest experiments considering the relationship between your body and the camera. Can you describe the origins of your interest in gesture within your performance work? All of my work is routed in the history of performance video art. In this early video work, the body’s mediation by this new technology is often investigated. I have always been specifically interested in the reflective circuit that this “performance for the camera” creates. Specifically in the description outlined in Rosalind Krauss’ Aesthetics of Narcissism. Gesture, in this context, can be as simple as a diverted gaze or as complicated as the creation of a persona. In either case, the technology fundamentally shifts our understanding of our bodies (including psyche). It reflects and extends the human body in real time within an electronic circuit. My continued interest in the body involves extending this techno-historical trajectory to understand the implications of extending our bodies within contemporary performance for the camera situations, otherwise popularly known as internet-connected portable computers with built in cameras. And you quite literally extend your body in much of work - in Public Sculpture your arms are replaced with a shifting mass of 3D geometric primitives and in Transhuman Dance Recital #1 (2007) you shed the “imitative constraints of the natural world” and are reborn as a posthuman video life form. Could you contextualize both of these pieces in relation to your comments above? Sure, I think in both works I’m playing with this idea that if technology modifies and extends our behaviour and likeness than it represents the next stage in human evolution. For instance, at least half of all the humans i see in a given day have an arm bent at a perpendicular angle with their heads tilted similarly, their ears plugged into their hands and can often be heard muttering to themselves. In my work I like to imagine what computers will have us doing in the future. What choreography will we perform with them and what absurd extensions will we wear so that we can be friends? I look at most of the world through my laptop and my phone. I think of these devices as I think of the glasses I wear to correct my nearsightedness, only they are not transparent, they are reflective. The documentation for VideoPaint 2.0 (2005) comes across as kind of a mashup between a campy promotional video, a software development diary and an artist talk - you seem to oscillate between these ‘voices’ in much of your work. Given these general themes, what can the software demo teach us about performance art? I think you have to look at the history of performance for the camera. I often tell a story, a somewhat abstracted version of history, that helps me explain my position. It goes like this. In the 1960s, performance artists were grappling with and debating documentation of their work. Photography and film had been used but were terrible substitutes for actually witnessing a performance. Aside from photography’s obvious faults as a non-time based form of documentation, film was limited in length, expensive, difficult to process and didn’t include synchronous sound. When The Portapak, the first consumer video camera, was released in 1969 it was seen as a progressive alternative, cheaper, not nearly as time limited, easy to review, and portable. But artists quickly realized it was still full of compromises. Because of it’s low cost and live preview ability they began to experiment with this new media as a sketching device. Many made works in their studio where they hooked the camera up to a monitor and watched themselves performing as they recorded. It is in these works that artists first realize and acknowledge the term performance for the camera. They literally perform for a reflection of themselves they see in a monitor. You can actually see this in a lot of early video works, eyes are often looking off camera at a TV monitor just off screen. For a decade, this type of work develops it’s own theoretical groundwork and aesthetic characteristics. I like to say this is the era in which persona really emerges in art. That said, my interest in demo culture stems from the decade that follows this hyper reflexive period. In the 1980s, computer artists begin to write software that is unreliable or non-portable, i.e. that requires documentation for them to show audiences. 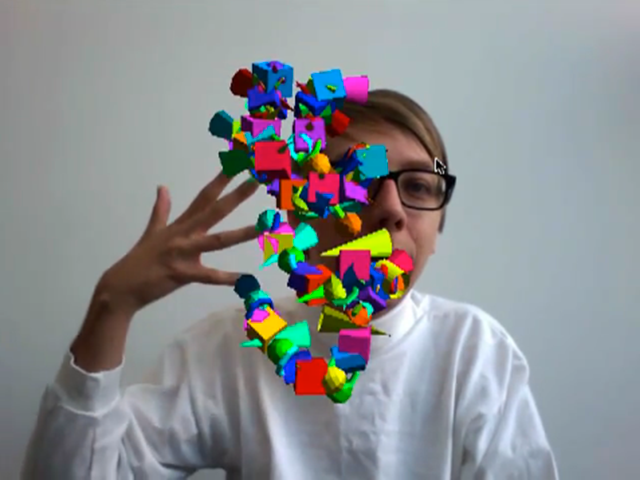 Just like the 1960s performance artist, the computer artists turn to video to document their works. The difference is, they fail to acknowledge the camera or themselves. It’s like we’re supposed to assume that they are both invisible. In modern demos, the camera is often the machine that’s being demonstrated (a computer). It is the interface in this more recent context that takes on the role of the artist. It represents a crazy moment in performance history when the machine entirely consumes the artists body and persona. Basically it’s best to describe a demo as a computer that uses a human rather than a human that uses a computer. Or in performance history terms, a demo is a camera that demonstrates a human. That human is the ignorant mess I play in my work. Video Terraform Dance Party and WarMail (both 2008) riff on resource management and strategy, which are both central themes within gaming. In the first piece, your cumulative actions shapes a simulated nation and in the latter, a crowd of participants are charged with helping you to write an email to your mother. To what degree does gaming influence and inform your thinking on performance and software? Gaming was a huge part of my youth but I wasn’t allowed to have a console system until I was about 15, at which time I got a PlayStation. For most of my youth I had a Mac SE and then a Mac II, and a limited selection of games. Probably because we didn’t have very many games, my younger brother and I would make our own games using HyperCard, and later Adobe Director. These games were often not games at all but little worlds that you could just navigate and explore. They were these little places where we were god, where we set the rules and where whatever we imagined was possible (though what we often imagined was just a pathetic simulation of the real world). I remember I often fought with my brother about how perfect these worlds should be and I coined this term that I would shout out over and over again, “Imperfection is Perfection!” I considered “imperfection” to be a truer reflection of reality. This way of thinking about computers stuck with me, when I sit down to use my laptop I still feel that sense of limitless possibility at my fingertips, but I still end up seduced by the simple premise of an imperfect world under my own control. The imperfection of something that is so purposefully designed still makes me smile - BTW my brother became an architect. The terrain manipulation in Video Terraform Dance Party totally reminded me of the seminal ‘god game’ Populous (1989), and WarMail co-opts the vector graphics of Asteroids (released a decade earlier). Those retro gaming references coupled with your featuring 80s pop mainstays New Order and A Flock of Seagulls in other work make me wonder: to what degree is your work nostalgic? Haha, yah, I’m very nostalgic. As I mentioned earlier, I have a pretty strong feeling I lived the best years of my creative life from age 7-18. I’m not sure how many hours I spent making stuff on my computer but it’s enough that most photos and video of me from that era are from behind, sitting at a desk with my brother and sister at my side making cool stuff on our home computer. I should probably be making things in black and white with crazy basket woven patterns, but I was literally SO excited the year I got a colour monitor that the idea of colour on a computer still excites me to a level of magnitude I can’t quite describe. You’ve been researching and experimenting with computer vision for years - what are some other applications utilizing this technique that you’ve been inspired by? Also, what are your thoughts on the burgeoning augmented reality (AR) industry? I’ve always liked a lot of the AR demos that are online, there are so many good ones. I have been particularly fond of ones where people have attached tags to their bodies to create software suits (the inspiration for my public sculpture work). The fact that AR is getting so much popular attention is great, it makes me look like I was ten years ahead of the curve in terms of sandwiching computer graphics with video in playful ways. I’m just happy to have a culture I can refer to and be further inspired by, I actually wish it would move faster! We’ve reached a level of saturation with video conferencing and live effects that most people have dealt with an augmented/software reflection of themselves at some point and may be prepared to think more critically or behave more creatively in this context. It’s just awesome that I can finally talk to my mom about this stuff now and she sort of gets what I’m talking about. find an arbitrary public webcam of a public space , track an arbitrary colored pixel in the frame, arbitrarily shift its value and render a basic open GL geometry over the location of said pixel. together with any medium and not have it blast your eardrums.